I love Italian food. Who doesn't? Italian cuisine is one of the most popular in the world, yet in some ways it is also extremely misunderstood. The concept that many people - particularly those in the United States - have of Italian food is actually quite different from how authentic or "real" Italian food is prepared and served in Italy itself. Now, I confess I am a bit of a food snob or "foodie", but I grew up in a family where cooking was very important, and where my mother and her mother both learned how to cook authentic Northern Italian cuisine from my father's family in Italy (I was born in Ancona, on the Adriatic Coast of Italy, and my father's family comes from San Marcello Pistoiese, a small comune Northwest of Florence in Tuscany). My education and experience in Italian cuisine continued as I grew older, began studying many Italian cookbooks, and then had the chance to travel throughout North and Central Italy, including Rome, Florence, Venice and Milan. I take Italian food very seriously and like to respect the traditions and values of Italian cuisine as honored in my "Mother Country". This is not to say I don't enjoy many dishes and aspects of Italian-American cuisine (which is what the majority of restaurants in my area serve, and is the food developed by the immigrants who came to this country in years past) - but it is not the same thing as traditional Italian food in many cases. Indeed, it is in many ways its own unique cuisine, adapted from the Old World to suit different ingredients available in the New World and the blending of different immigrant cultures. If you want to learn more about authentic Italian cuisine - the food you will find in the actual ristorantes, osterias, and home kitchens of proud home cooks in Italy - read on. I'll share some of my top tips and observations, as well as recommendations for cookbooks where you can learn a great deal more about authentic Italian cuisine and how to prepare it in your own kitchen. All photos on this page are by the author, sockii, unless otherwise indicated or provided by Amazon. Italy is only approximately 116,330 square miles in size - closest to the state of New Mexico in the USA - yet for a small country it has a hugely diverse range of cooking styles and unique cuisines. The Italian food one would find served in Tuscany is quite different from what you would find in Apulia down in the "heel" of Italy's boot, or in the mountainous region of Lombardy near Switzerland. A linguine with clam sauce served in a southern region would likely taste of spicy fresh olive oil; in the North, it might be prepared with creamy butter instead. In Venice or one of Italy's stunning coastal towns, seafood is celebrated in nearly everything, yet in the mountains one will dine on hearty rabbit, venison or beef stews. Trout is a specialty in Milan and the nearby lakes, and Rome has a very unique cuisine combining Kosher Jewish traditions. Sicilian cuisine is particularly different, featuring African and Arabic influences in the use of certain spices and flavor combinations distinctly different from "mainland" Italian cuisine. Studying cookbooks focused on the regional cuisines of Italy is the best way to learn all about them, whether you are planning on traveling to Italy and want to best taste each city's food, or want to know how to prepare it best at home. Generally it is a good idea to serve complementary dishes together: A Risotto Milanese made with saffron alongside the region's traditional ossobuco; a refreshing fennel, orange and black olive salad from Sicily alongside grilled swordfish. The incredible variety of cuisines throughout Italy are well worth studying and exploring, to understand that Italian food is far more varied and complex than spaghetti and meatballs (a dish you actually will rarely see on a menu in Italy! *) and eggplant parmesan. * In Italy, meatballs ("Polpetti") are typically served as a main course, or "secondi", after a pasta first course. Although today out of print, this title is well worth seeking out if you can find a used copy on-line. 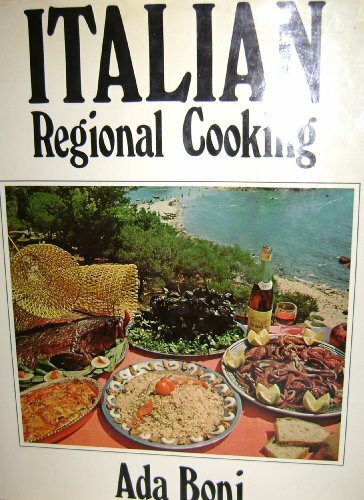 It is, in my opinion, "the" classic cookbook about the different regional dishes and cuisines of Italy, explaining their origins, the stories behind their names, and how to prepare them simply at home. The recipes are short, simple, and all very true to their origins. It is one I find I refer to regularly when studying how to recreate dishes I have sampled in Italy and want to learn to prepare at home. Published in 1987, Hardcover. 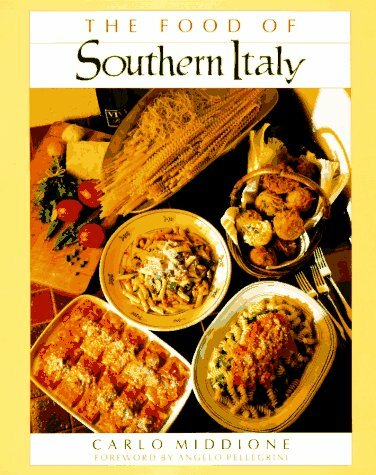 Nearly 300 pages covering the cuisine of Piedmont, Lombardy, the Veneto, Emilia-Romagna, Tuscany, Sicily, Sardinia, Roma-Lazio, and all the other regions of Italy. Italian food is not just regional, but highly seasonal. Cooking with the seasons and when produce harvests are at their peak ensure the most intense flavor and complementary tastes. In the fall, porcini mushrooms are harvested and featured in delicious pasta and risotto dishes, or as a hearty topping over polenta. Young and tender artichokes are celebrated when in season in Rome and elsewhere, fried into crispy flowers. Squash blossoms are enjoyed in the summertime, stuffed with cheese or lightly dressing a pasta or salad. In the winter, Italian chefs rely on the preserved, dried or canned harvest from the summertime such as dried legumes or canned tomatoes. Certain dishes such as Bollito Misto are only meant to be cooked and enjoyed in the wintertime - indeed, a waiter in a good restaurant in Italy would look at you funny if you tried to order it during summer months. Purple artichokes, enjoyed in Venice during the early summer. Seasonal cooking is becoming more trendy and common in American cuisine today, as it has been understood for centuries in Italy. To embrace seasonal cooking, be sure to visit local farmers markets throughout the year to learn what is freshest during spring, summer, fall and even winter. Avoid fruits and vegetables shipped across continents or grown in hot-houses, tomatoes forced to ripen off the vine instead of under the sun. In this way, too, you will come to appreciate certain foods more, by making it a special occasion to enjoy, say, first-picked strawberries in the springtime when they are at their peak of flavor. Noted chef Marc Vetri shares basic and advanced techniques related to Italian food and cooking in this beautiful, educational cookbook. Learn how to make fresh pasta, different styles of pizza, and even cure your own sausages and other meats at home! 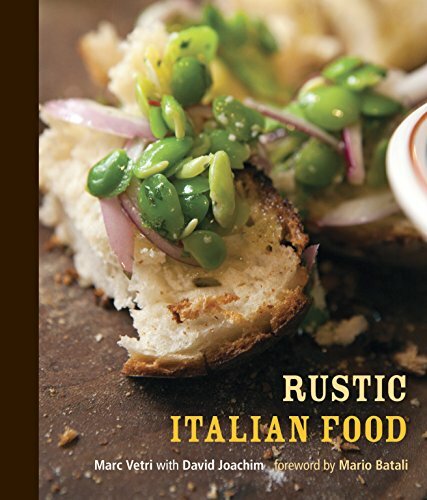 It's a wonderful cookbook that any lover of Italian food should check out. Many authentic (and delicious) Italian dishes require a very limited number of ingredients to prepare properly. After all, if you are using the best, seasonal ingredients, you want to allow them to be in the spotlight and be fully tasted on your plate. Grilled summer vegetables need only be dressed with olive oil, sea salt and fresh ground pepper. A beautiful risotto may feature one or two primary ingredients (such as langoustine or spider crab), but little else beyond the standard base of cheese, onion and butter. Italian cuisine is typically not one which requires lengthy lists of ingredients or hard-to-find spices; it is more about being thoughtful and understanding your ingredients fully. Apply this tip when preparing pasta and pizza dishes at home: don't overload a homemade pizza with too many different toppings. Make a pasta primavera with the few best fresh vegetables from your garden, not every last bit and scrap from your fridge. Last night I spoke with a Italian who bemoaned how "Americans" throw "too many spices" into their tomato sauce; in her words, "Marinara should only be olive oil, tomatoes, salt, pepper, onion. Nothing else! And a toss of fresh basil at the finish." No cookbook author has taught me more about Italian cooking than Marcella Hazan. Her books were all staples in our home kitchen growing up, and her careful, detailed recipes and preparation tips taught me a great deal about how seriously Italians take their food! Basics from preparing homemade pasta, sauces, vegetable sides, classic veal dishes and seafood specialties are all covered here with recipes from throughout Italy. Hardcover, published in 2002. Combining the recipes in Marcella's first two cookbooks "The Classic Italian Cook Book" and "More Classic Italian Cooking", both long out-of-print and highly sought-after by fans for years. This is THE Italian cookbook for anyone who wants to learn the basics of Italian cooking and food philosophy from the "ground up". 4: Go Easy on the Garlic! Tuscan-style Crostini with Tomato, Arugula and Mozzarella as served in Florence, Italy. This may come as a surprise to those used to the "Olive Garden" and other popular Italian chain restaurants in other countries, where mountains of chopped garlic seem to be par for the course whether you're ordering fresh bruschetta or pasta in tomato sauce. But the truth is, most Italian cooking in Italy uses garlic very judiciously, if at all! A clove of garlic might be crushed and rubbed over grilled bread for crostini, or placed in heating olive oil to gently flavor meat or vegetables to be pan-fried. But the garlic is often removed before serving, and absolutely removed from the cooking pan if it becomes heavily cooked and could risk turning a dish bitter and burnt-tasting. Indeed, most people I know in the US who are direct immigrants from Italy look at garlic with dismay and distaste, particularly in how it is overused in much of what is considered "Italian food." And as someone who suffers from a garlic intolerance myself, it can be frustrating to hear from people, "But you're Italian, how can you not love garlic?!" It is also worth noting that in general, in authentic Italian cooking, garlic and onion is rarely used together in a single dish. Care is taken in deciding whether onions, shallots, or garlic best serves a recipe. They are not piled on top of each other in the same recipe. Go beyond the "stereotypes" of Southern Italian cuisine that most Americans may be familiar with. Learn how to prepare authentic Southern dishes such as Tuna and Fennel Seeds, Sicilian Eggplant Relish, Clay-cooked Prawns, Chick-peas in Olive Oil, Cannelloni Stuffed with Fish and Lamb Stew with Wild Mushrooms. These are classic dishes that will be brand-new revelations to the home cook unfamiliar with these traditional Italian meals and delicacies. Published in 1987, this volume is still readily available via many used booksellers on line. Filled with over 300 pages spotlighting pizzas and breads, sauces, egg dishes, antipasti, soups, first courses, main courses, side dishes and desserts. 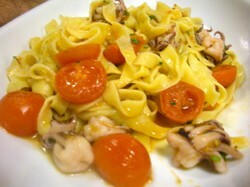 Pasta prepared with cherry tomatoes and pistachio nuts, as served in Milan, Italy. Pasta is of course one of the staples of Italian cooking. But preparing a traditional pasta dish involves a bit more than dumping noodles in a boiling pot of water and smothering it in sauce when cooked. Italians typically enjoy pasta as a first course before meat or fish, so smaller portions are traditional. Pasta noodles should be cooked in salted water for maximum flavor, drained while still al dente ("firm to the tooth"), and tossed with sauce over the stove to allow the flavors to combine while finishing cooking. Don't drown your pasta in too much sauce, either; noodles should be lightly coated but not sitting in a pool of sauce, oil or cheese. 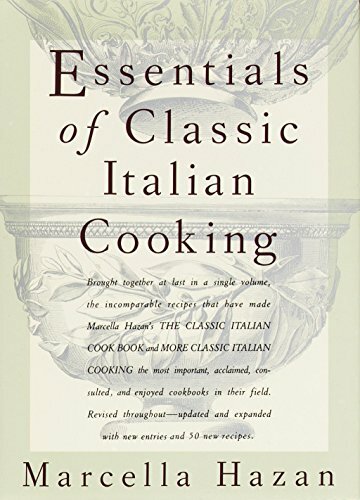 Many consider this book THE standard and essential volume on Italian cooking, particularly when it comes to Tuscan and Florentine-style cuisine. Your mouth will water as you contemplate his suggested 4-course dinners (perfect for entertaining and amazing guests at home) such as Pasta e fagioli, Tarragon Rabbit Stuffed with Artichokes, Fried Artichokes and Cenci (deep-fried pastry snacks). Although some of the dishes may seem complicated or difficult, the directions are detailed, often illustrated and easy to follow. Revised and expanded 1990 edition featuring over 300 recipes, including 30 specially researched and selected for this collection. 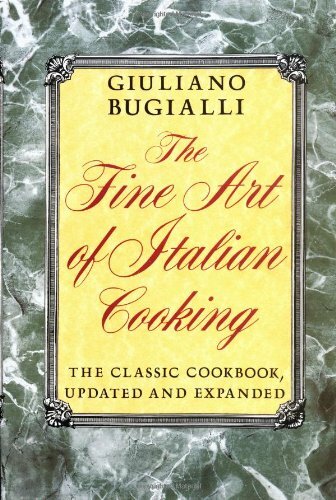 A "must have" reference for those serious about refined Italian cooking at home. 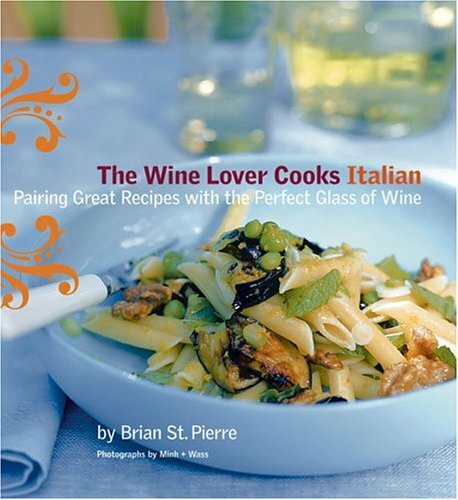 Italian food and wine truly go hand in hand, and this volume is an easy to follow introduction to both the regional foods and wines of Italy. It looks at the six main geographical regions of Italy and first discusses the traditional wines in language that even a vinophile novice can understand and appreciate. Then, wonderful recipes from each region are presented with tempting photographs, simple instructions, and suggested wine pairings. This is a delightful book to both read and experiment with in the kitchen. Over 200 pages in length with full color photography throughout. Discover delicious Italian dishes you can make at home like Sea Bass Roasted in Red Wine Sauce; Rosemary-Smoked Roast Chicken; Penne with Mushroom-Olive Cream; Prawn, Red Pepper and Leek Risotto; or Parmesan Beef with Balsamic Sauce.